Day 242: A Little Too Sweet . . .
Today was a good, crazy day – – between a cracked windshield, a binder clip poking a hole in the bottle of a styrofoam cup of Coke (for the record – the cup holders in a Jeep can hold up to 20 oz of liquid – what can your car’s hold? ), and checking with dear friends who just opened a B&B here in San Marcos – it was a busy, but good one. D#1 is days away from her final college exam before graduation coming up soon and D#2 is fighting a cold preparing for her final college exams before coming home for a visit from the East. Looking forward to some time with all four of us together under one roof. Life is just zipping by – can tomorrow really be May 1st? Wow!!! So . . . tonight was a stretch for us. We knew that we’d be faced with one of these situations. It’s like you’re driving and you look ahead and see really dark clouds, and that’s when you know that you’re going to have to drive through a thunderstorm. Or you know you’ve got a test in a tough class, and you’d really rather be doing anything other than studying for the test but you know that you’re going to have to study in order to take the test. It’s like having a client who you know is not a happy camper, but you have to go and face the music by visiting that customer in person. Tonight–for us–is all of these things wrapped up into one wine. Now, don’t get us wrong. We don’t mind trying new wines. Shoot, we’ve probably tried 220 new wines of the 241 tasted so far, but as we’ve been told and even noted ourselves, we tend to focus more on red wines than anything else. We’ll sprinkle an occasion white wine in there to keep some folks reading . . . but a rose’? We’ll have to confess that this one was going to be – if you’ll pardon the pun . . . tough to swallow. 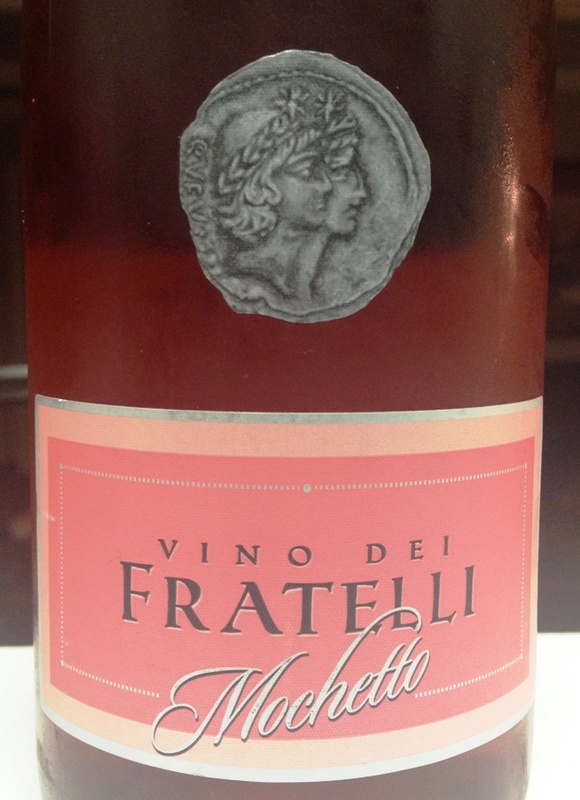 Tonight we opened a 2011 Vino dei Fratelli Mochetto — a dessert wine made from moscato, muscat and delle venezie varieties and hails from Northeast Italy. Believe it or not, Wine Enthusiast rates this wine at 85 points which to us seems high for a dessert wine. The taste is very fruity and sweet–almost syrupy sweet. It’s a pale pink sparkling wine that offers easy aromas of sweet raspberry and pink grapefruit. It’s a rosé sparkler that will pair well with fruit ice cream or panna cotta with fresh forest berries. Priced around $15-$17 a bottle, it’s not a ‘throwaway bottle of wine’. IF you like dessert wines, you’ll like the freshness, the crispness and the sparkle it gives off in the glass. We served it chilled but could easily see it being served as just a bit cooler than room temperature. For red wine lovers, it’s not going to make it on the top 10 list–let along the top 365 list! Have to give our friends at HEB some credit – they told us we had to blog about this wine – just because . . .
We can officially say that we’ve tasted and blogged about a dessert wine, and if we were fans of dessert wine, this one would be a winner. BUT, we just don’t care for the sweetness of it. It didn’t stand a chance when we realized we were going to be faced with trying a dessert wine. Well, chalk it up to experience. . .and try to enjoy YOUR favorite wine responsibly. Please remember to recycle whenever possible. Categories: Uncategorized | Tags: H-E-B, Mochetto, Vino Dei Fratelli | Permalink.